And the wind whispers...: Things we talk with a rickshaw wala. In an exotic city like Mumbai you might often find yourself travelling in a rickshaw ("an extended scooter with a cap" as quoted by one of my favorite youtubers) and frequently even find yourself chatting with the rickshaw wala. It would be remiss of me not to mention the fact that these men often find company in various passengers they transport. And a conversation with a rickshaw wala is not always restricted to weather, petrol and how the roads in Mumbai are made in potholes. So here's a list of things you talk to them about, while you are alone in the back hoping you don’t find much traffic in Andheri. 1. Whenever a young enthusiastic biker dangerously overtakes the rickshaw: "Kaise chala raha hai bevda. Kuch civic sense hi nahi hai. Kisne diya isko license." (How this is drunk man driving! No civic sense at all! Who gave him the license?). The rickshaw walas response will usually be a very short voluble one, with lot of flapping gestures with one hand. This statement usually leads to young rickshaw guys being offended for being called "bhaiya" (brother) and then escalates to you either paying the whole money while cursing under your breath or the rickshaw wala giving you a murderous look while he drives away with half the money. 3. Some rickshaws are decorated like brides. Ornate with stickers on the windscreen. These stickers include vicious cobras, old pictures of new Bollywood actresses and some random incorrectly spelt, grammatically incorrect English phrases. There are chances that in these rickshaws you will even experience a halo of neon green, blue or red lights circling your head making you feel like you’re in a mobile night club, all alone (sans the rickshaw wala). At this point I shall mention, you wouldn't be striking any conversation with this rickshaw wala. But rather making awkward eye contact with him, through the rear view mirror while he silently grooves to the music on his speakers (yes there r speakers in these types rickshaws). By now you are wondering whether you should courageously jump out of the rickshaw for your own safety, or wait till you reach your destination, and then run for your life. 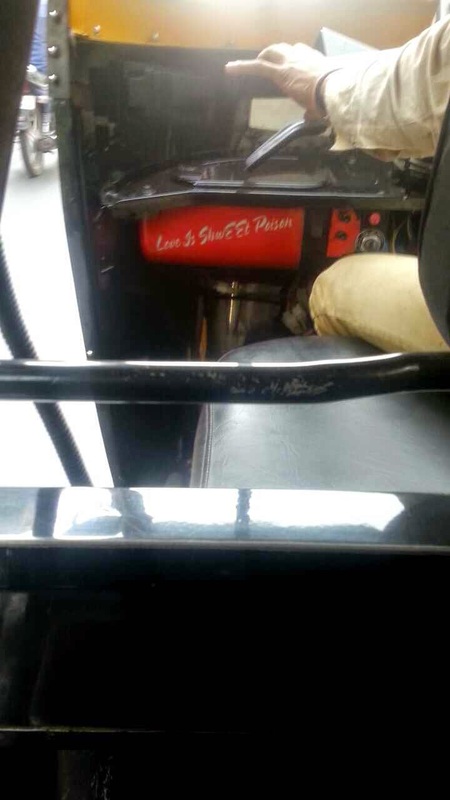 So if you ever find yourself in a rickshaw with "love is shweet poison" banner below the steering handle, I suggest jump out of the vehicle. 4. Very rarely, you will find a rickshaw guy who is educated, and even more rarely you will be travelling with Mr. Rickshaw driving teacher. If you are in any kind of uniform, you will be fired with math questions you have been escaping in the class. Just sit and stare blankly acting like kid with a low IQ. Believe me there is no pressure at all to answer these questions. In this one sided conversation, your response will range from stammers to false hiccups and the journey will end with you paying and running away without collecting the change. 5. Its highly frustrating when someone doesn't give you change. And in a journey worth 60₹ the rickshaw wala doesn’t have 100₹ change, other than the fat stacks of 10₹ in his breast pocket. This will either end with the rick guy making a tch tch noise and removing his stacks or you giving up and walking away without change and leaving a happily grinning beer bellied man. 6. Weather, food and traffic are very common topics you will be talking about with the rickshaw wala. And these are the only conversations you will be initiating, intentionally. Either you are bored and hungry, or just one of those chattering people who talk to every second person they find. 7. This is the most experienced and shortest conversation/interaction by EACH AND EVERY MUMBAIKAR. You will be standing by the edge of the road and waving your hand for a rickshaw. A rickshaw might stop and the driver will look at you expectantly, and with crossed fingers and a clenched stomach you will name your destination. Again, At this point I shall mention that... The probability of the driver saying yes for taking you to your destination much less than Miley Cyrus becoming Hannah Montana again. And the way the rickshaw wala denies you is a gesture of sheer arrogance and attitude. They simply drive away without giving you a second thought. And you will be standing there like a lost puppy disowned by its owner. 8. This is one of those times when one would not prefer having a conversation with the rickshaw driver. Because there are chances you will be busy making out with your boyfriend or girlfriend in the backseat. And if you haven't noticed, the driver will be adjusting the rear view mirror (which look like two ears for a rickshaw) not to look at the vehicles behind, but to look at you doing hanky panky in the back seat. So well, that's the end of the list, I guess. We Mumbaikars have learnt to live with these conversations since they are part of our daily routine now. Rickshaws travel on the roads of Mumbai like blood flows in a body and get stuck in a traffic jam like a clot on a wound. How much ever we cry about the rickshaws fare shooting skywards, we can’t help but use the phrase "bhaiya [enter destination] jaoge kya?" (Brother will you take me to [enter destination]? )ever so often. So either keep up with the soaring prices and unwanted/awkward conversations or learn to fly. Few words- Rickshaws are also known as "Auto". for some reason. For more information go on wikipedia. I just saw a whole page on rickshaws there. I love vada pav. Hahaha....thoroughly enjoyed this post..We have same attitude in Auto Rickshawallas in Delhi. Just some change in language but attitude remains the same.